Brisbane Broncos premiership star Brittany Breayley has pledged her allegiance to the club despite uncertainty around what her National Rugby League future holds. 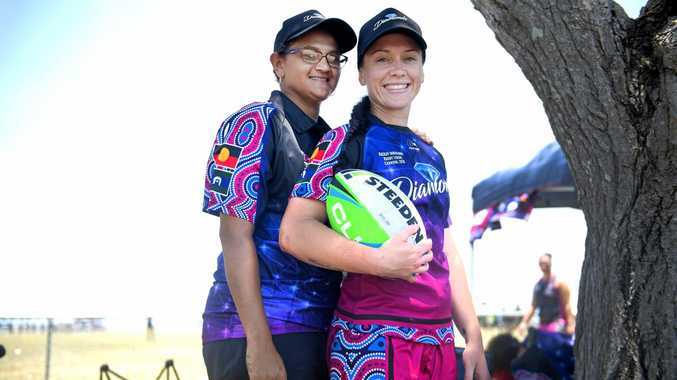 The inaugural women's Dally M player, who was in Mackay at the weekend for the Indigenous Rugby League Carnival, is out of contract with the powerhouse club but said loyalty, not money, would come first ahead of the 2019 season. "I have to go back through the ranks again and get a look in, hopefully with the Broncos, but there's still a big (club) season ahead before the NRL season," Breayley said. "We always keep our options open, but money is never a factor for girls like myself. "We play for the love of the game, so loyalty is probably where I stand. "So I'll stay loyal to the Broncos... I'll keep my options open, but I'm happy with the Broncos." In a huge year on a personal level, Breayley was also a key cog in the World Cup winning Australian Jillaroos' side. Capping it off in her hometown of Mackay as part of the Indigenous Diamonds' side, Breayley was ecstatic to be able to give back to the grassroots level and was honoured to be suiting up for the team after watching on in 2017. "I played two years ago, and I was up here last year running water for the Diamonds, but couldn't play because of the World Cup, so I'm happy to get the boots on this weekend," she said. "I know how much it means to the Indigenous girls out there and playing for their mob is a huge thing, just like me playing for Australia. "Representing their mob is a massive achievement and you always honour the indigenous girls, so it's great to have a run around with them. "I love coming back to Mackay, this is where I started my rugby league career and it's always good to give back to the community." The Diamonds, coached by Breayley's best friend Julie Nielsen, is packed full of talent, with the likes of Mackay and District Rugby League premiership players Cheyenne Twidale and Katie Green part of the side. 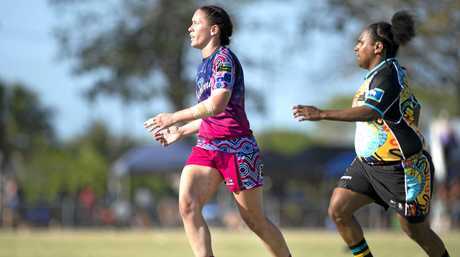 The carnival, which attracts more than 30 teams from as far as the Torres Strait and Cherbourg, celebrates indigenous culture through rugby league. Breayley said the carnival was a key event on any rugby league calendar and while professionals like herself, Ben Barba, Dane Gagai and Josh Hoffman were all at the top level, it provided a unique opportunity to play with friends and family at the weekend. With her Diamonds' side winning the grand final, Breayley said the competitive side was always there and while the chance to add another title was enticing, she simply had to just "pinch herself" after a stellar 2018. "I still pinch myself every day... I can't believe I got to run out as a Bronco," she said. "As a young girl I never thought I'd get the opportunity to play in something as huge as the NRL. "It was a short season, but it was a great one. "To end the season as a premier and get the ring just like the men was an absolute honour and I can't wait to do it again if I get the opportunity."